Single Phase Air Cooled Voltage Stabilizer, offered by us, is manufactured using quality approved components and the latest techniques at our well-equipped production house. Also, it is tested on the parameters of quality, durability and functionality in order to ensure its defect-free mechanism. 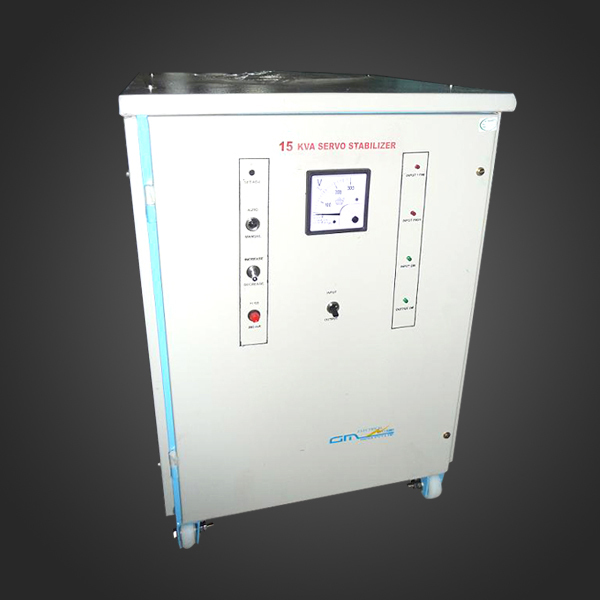 Our Single Phase Air Cooled Voltage Stabilizer is also delivered on time so as to maintain trust of the buyers. One can obtain Single Phase Air Cooled Voltage Stabilizer from us at a very reasonable price. Speed of Correction	 60V per sec. Indications on each phase Input on,Input Low,Input High,Output On,Output Cutoff. Controls on each Phase	 Auto/Manual Selector Switch,Increase/Decrease Selector Switch,Volts adj. Potentiometer. Metering Voltmeter to read Input and Output Voltages with selector switch. Other Indications &Controls	 Input Output Indications ,Reset Auto/Manual selector switch Output On Switch Output off Switch.